LAFAYETTE, Ind. — Industrial Federal Credit Union kicks off the 2009 Community Harvest Food Drive on Friday, October 10th. Monetary and food donations will be accepted through Halloween (October 31) at various locations throughout Greater Lafayette. In 2008 more than 104,000 pounds of food was gathered and nearly $26,000 was donated. The 2009 goal is 120,000 pounds of food. Community Harvest is an annual event that brings together businesses, schools, churches and citizens through a series of food drives and fundraisers benefiting Food Finders Food Bank. Since its inception nearly 20 years ago, the collaborative efforts of Community Harvest have provided mid-north Indiana with record amounts of food and funds to help feed the hungry in Greater Lafayette. “This year’s event has the potential to help so many people”, said Kim Motuliak, Food Finders Development Director. 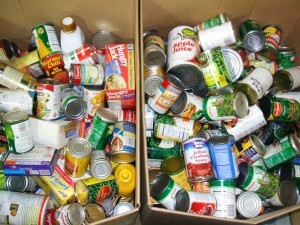 “We are kicking off the 2009 Community Harvest Food Drive on October 10, 2009, with Food Finders Family Fun Day. We are encouraging everyone to stop by the food bank, join in the fun and sign up to collect food as part of Community Harvest. We are starting with the “Food for Thought” school food drives from October 10 through Halloween. These kids work so hard to make a difference, it really is exceptional.” Motuliak said. Local businesses are being asked to join in the effort by doing food drives with their employees. Last years total was greatly affected by a large number of small donations coming from businesses, service organizations, churches and families. In 2008 more than 104,000 pounds of food was gathered and nearly $26,000 was donated. This year’s goal is 120,000 pounds of food. Anyone interested in helping with the 2009 Community Harvest is encouraged to contact Food Finders Food Drive or visit their website at www.food-finders.org.